As a family dentist in Seaside, our staff knows firsthand that many patients simply hate to floss. Our goals isn’t to start lecturing or make patients feel bad when the subject of flossing comes up, but the habit does play a pivotal role in protecting your long-term oral health. But just how far would some people go put off flossing? A recent study conducted by The American Academy of Periodontology found that over 1/3rd (36 percent) of Americans would rather perform an activity they dislike rather than floss. The results of the study were published on the AAP’s social media website Gumblr.org where the organization also publishes articles, videos, games, and quizzes designed to promote better oral health. Untreated dental disease currently ranks as the number one chronic illness in the U.S. Roughly half of Americans suffer from some form of gum disease (gingivitis, periodontitis, or periodontal disease) and don’t even realize they have a problem. The Centers For Disease Control and Prevention estimates that more than 64 million Americans 30 and over currently suffer from swollen and inflamed gum tissue, two of the primary indicators of gum disease. The disease impacts the lives of even more senior Americans, as roughly 70 percent of the country’s population over 65 suffers from gum disease. Periodontitis, an advanced form of gum disease, erodes oral tissue and underlying bone structure that leads to dental decay and permanent tooth loss. Gum disease is the result of oral bacteria infecting gum tissue, which causes inflammation to develop. When oral bacteria is allowed to remain, it creates plaque which then hardens into tartar, a yellowish substance that stains enamel and can spread below the gum line. Only a professional cleaning by a member of our team at your family dentist in Seaside can remove tartar build up. When gum disease is allowed to progress, it can cause painful and potentially permanent symptoms. Warning signs of advanced gum disease include red or swollen gums, tastes that won’t go away, persistent bad breath, receding gums, tooth sensitivity, and discomfort chewing. A variety of factors can lead to the development of gum disease, including poor oral hygiene, crooked teeth, genetics, stress, smoking, and diet. Recent studies have also found compelling links between gum disease and an increased risk of a variety of chronic health conditions, including cardiovascular disease, stroke, diabetes, dementia, and cancer. Despite the risks that come with failing to floss, many people would still rather perform some distasteful tasks instead of flossing. This list seems rather extreme considering the inherent benefits that come from flossing. 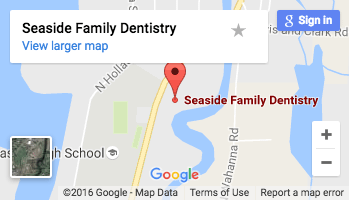 Your family dentist in Seaside hopes that flossing doesn’t make you want to sit in traffic or pull out your toilet brush. Just keep in mind the benefits of flossing the next time you start thinking about what you’d rather do instead of protecting your long-term oral health.